The season is indeed upon us. The RV blogs are full of stories from the road. In less than a week, I'll be out there! But there's a plot line in many of these stories that I'm taking seriously: Power problems in camp grounds. Two kinds of problems. One is power surges, sometimes due to thunderstorms. This is the kind of thing for which we can buy pretty inexpensive surge protectors at Radio Shack. The more insidious problem is pretty rare in most residential settings: brownouts. There we all are in Happy RV Kamp with our a/c running. 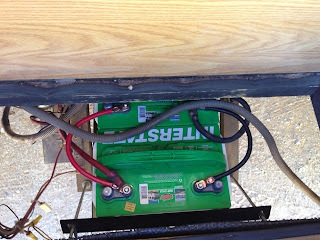 And one by one, as the compressors kick in, the campground power supply is stressed. And low voltage can do serious harm to lots of components in the RV. The story line goes, "Man, it would have saved me so much money if I'd just gotten a power conditioner." So I did. Sigh. It's an insurance premium, I guess, which I only pay once. But, like, "Ouch!" Replacing the incandescent bulbs with LEDs can wait a while. Two new deep-cycle 12 V batteries, snug under the top step. 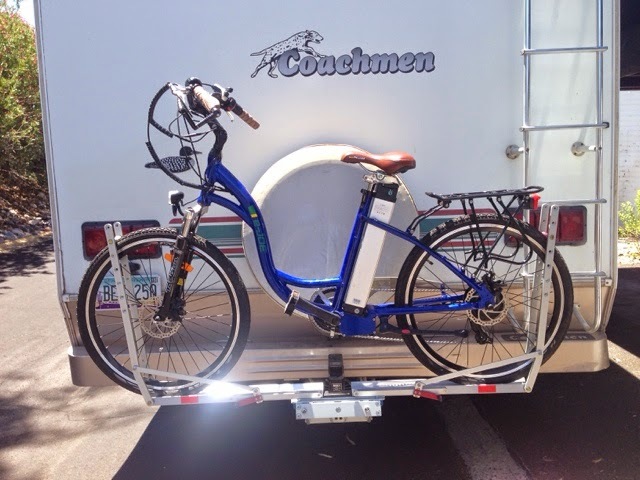 This will make camping off the grid a little more pleasant and reliable. Lights, water pump, and the refrigerator all depend on 12V power ... even though the reefer is LP-cooled, its control circuits need 12V. Future improvements in the power system: an inverter for a source of clean 115V AC, a surge protector to protect against weirdness in campground electrical hookups, and maybe solar of some kind, even if only a trickle charger to keep batteries charged up when in storage. I finally found a locksmith who'd cut duplicates of the key for the e-bike. They mostly have a policy that they won't cut customer blanks, and they didn't have blanks for the one key I got with the bike. The company sent me a couple of blanks and I finally convinced a locksmith to cut them. The storage compartments under the coach are all an the same key. Apparently, all the storage compartments in the world are on the same key! I ordered a bunch of new more secure tubular locks/keys, hoping that the install would be easy. Nope. This may be a project for when I get home, or even on the road. The Beast is here at home for the day. Maybe two. I'm getting various bits organized and ready to travel. So far, I've just thrown things in whatever drawer/closet/compartment was handiest. That would get old on the road for a couple of weeks, so I'm organizing. At the moment, with a Real Trip around the corner, even the housekeeping is kinda fun. As of now. The last of the known repairs and maintenance items are done, and I've installed a second coach battery to make "boondocking" easier. So far, I like the RV shop I took it to for this last batch of stuff Buck's can't handle. Convenient, and under budget. Just back from a great trip to San Francisco to see old friends and travel with them to an annual event up at Saratoga Springs. It was a good time, marred only by the kind of airline travel day on the way home that makes one want never to fly again! And, I'm sure, one which makes airline employees wish they'd taken a day off -- how they put up with a lot of people yelling at them about things they can't control amazes me. For what it's worth, the people of Southwest Airlines were great! And the airline did its best to take the sting out of it by issuing $200 vouchers for future travel. The final touch to a day of delayed flights and missed connections was that my baggage arrived in Tucson a day after I did. It was all fine -- and one of the bags had not one but two tags from the TSA contractor at SFO saying they'd been inspected by hand. Judging from the candies scattered around the bag, I'd say someone in TSA loves Jolly Ranchers. Back to the RV-related world. The Beast spent another day at Buck's, getting some brake issues attended to. The ABS sensor in the rear failed. That was replaced, the brake fluid drained and refilled and the brake system inspected inside out, and the computer got an upgrade. I've never had that before: the idea that my vehicle needs and operating system upgrade just like my phone is new. Makes sense, though. Next week Beast goes to an RV repair place near me to get a few things looked at: I'm headed up into the mountains where it will be -- I devoutly hope -- cool enough to want the furnace to work in the morning. It now makes a God-awful screech when the fan starts up. Enough to wake an entire campground. So that has to get dealt with. Then! July 6 I take off for 10 days going to and from Colorado, to see family and attend a couple of events back there: one in Denver, one in Dolores. Looks like about 1700 miles. I've been doing some route planning, and I gotta say that the various map applications make planning pretty easy. I've had no problems finding good-looking places to camp, and have reservations -- even in tourist country in July. Yay!